Hedgehog (Hh) Signaling | Signaling Pathways | BioVision, Inc.
Mammals have three Hedgehog homologues, of which Sonic hedgehog is the best studied: Desert hedgehog (Dhh), Indian hedgehog (Ihh) and Sonic hedgehog (Shh). The original hedgehog gene was identified in Drosophila and is named since the embryo phenotype resembles a hedgehog (covered with pointy denticles). Two vertebrate genes are named after species of hedgehogs (dhh, ihh) and shh after a video game character. Shh is involved in a wide variety of embryonic events and can act as both a short-range, contact-dependent factor and as a long-range, diffusible morphogen. Shh genes are highly conserved and have been identified within a variety of species, including human, mouse, frog, fish, and chicken. Mouse and human Shh proteins are 92% identical. In the human embryo, Shh is expressed in the notochord, the floor plate of the neural tube, the gut, and in the developing limbs. Shh is translated as a ~ 45 kDa precursor and undergoes autocatalytic processing to produce a ~ 20 kDa N-terminal signaling domain (referred to as SHH-N) and a ~ 25 kDa C-terminal domain with no known signaling role. During the cleavage, a cholesterol molecule is added to the carboxyl end of the N-terminal domain, which is involved in trafficking, secretion and receptor interaction of the ligand. The hydrophobicity of the signal peptide due to the cholesterol moiety is further increased by lipid modification; a palmitoylation of the highly conserved N-terminal cysteine residue (Cys-24) which is dependent on the cholesterol addition. Secretion and consequent paracrine hedgehog signaling require the participation of Dispatched protein. When SHH reaches its target cell, it binds to the Patched-1 (PTCH1) receptor, a 12-pass transmembrane protein. In the absence of ligand, PTCH1 inhibits Smoothened (SMO), a downstream protein in the pathway. 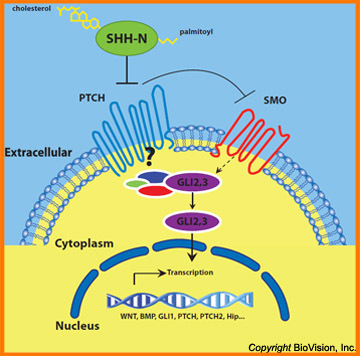 PTCH1 has a sterol sensing domain (SSD), which has been shown to be essential for suppression of SMO activity. The binding of Shh relieves SMO inhibition, leading to activation of the GLI transcription factors (activators Gli1 and Gli2 and the repressor Gli3). The sequence of molecular events that connect SMO to GLIs is poorly understood. The accumulation of activated GLI in the nucleus controls the transcription of hedgehog target genes. Mammals have another hedgehog receptor PTCH2 whose sequence identity with PTCH1 is 54%. All three mammalian hedgehogs bind both receptors with similar affinity, so PTCH1 and PTCH2 cannot discriminate between the ligands. They do, however, differ in their expression patterns. PTCH2 is expressed at much higher levels in the testis and mediates desert hedgehog signaling there. In the absence of ligand binding PTCH2 has a decreased ability to inhibit the activity of SMO.